Ensemble casts in comics, like in television, are only as good as their weakest link. Each character should be explored to become fully rounded individuals with an arc that makes people care about them. 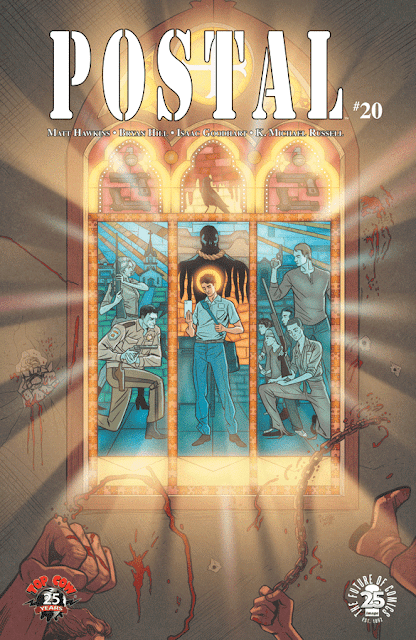 'Postal' #20 successfully demonstrates how it's done when you have characters with their own agency. One story ends and another begins in this explosive issue. Maggie has been through a lot. The unassuming waitress caught Mark's eye and was one of the few people of Eden that understood him and paid him much attention. Like everyone in town, she too was leaving behind a shady past to start anew. She couldn't help but be attracted to Mark's intelligence and innocence. He couldn't resist her kindness, her strength, her patience. Her relationship with Mark would put her in the hospital at the hands of Molly. She persevered and was always willing to fight back. It was only a matter of time before she and Molly would cross paths again. It was inevitable. Maggie had had enough though. She was done with Eden, done with Mark, done with the whole Shiffron family. Suddenly, she finds herself having the upper hand and isn't afraid to read Mark the riot act. It's one of Maggie's biggest moments. All hail the queen. Meanwhile, we get our longest look at Isaac Shiffron yet, the exiled patriarch of the Shiffron brood, bearded up and running a cult with Agent Bremble in the mix. He may or may be falling for Isaac's long diatribe about redeeming sinners and whatnot. It could all be one big scam for all we know. Either Way, it looks like he may have found a way to leverage Bremble to do his bidding. Is Bremble a convert or playing along? You'll have to wait at least 30 days to find out, boys and girls. Another Isaac, not the crazy cult leader, Isaac Goodhart is killing it in other ways. His layouts and camera work make the simplest of scenes pop and draw the reader in.Because this is more of a Maggie-centric issue she's framed either dead center or in a way that she looms larger than usual, larger than Mark, displaying her dominance. It may just be me but it fits the narrative perfectly. K. Michael Russell does some wonderful work as transitions from environments. The fields of the vast acreage surrounding Shiffron's compound, the interiors of Maggie's place, the exteriors of Eden, nightfall, the mayor's kitchen, and so on, Russell devotes a distinctive palette for each scene providing a different tone for each setting. 'Postal' under Bryan Hill has taken some dramatic turns with some of the biggest moves on the chessboard happening this issue alone. Maggie cements her place as a badass in much the same way Carol has on TV's The Walking Dead. She's no pushover and Hill has allowed her to shine. Now, the table is set for some really crazy developments. Make sure 'Postal' is on your pull list if it isn't already.